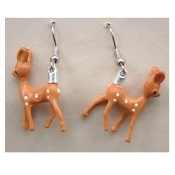 Funky Tiny Miniature Vintage BABY DEER EARRINGS - Cute Big-Ear Reindeer Forest Animal Novelty Costume Jewelry - Mini plastic dimensional hunting toy, rare Hong Kong diorama charms, approx. 5/8-inch (1.56cm) wide x 1-inch (2.5cm) Tall - Makes an adorable gift for your favorite winter hunter. Bambi and Rudolph lovers unite!